The advent of GPS has sadly rendered chronometers obsolete for navigational use. However, the beauty of Breguet retains relevance today. This is perfectly demonstrated with the latest member of the Marine collection, launched earlier this year at Baselworld, the Marine GMT 5857. The Marine collection fuses the traditional and contemporary with handsomely pleasing results. This latest version includes a second timezone, a useful complication for all travellers including intrepid seafarers. Breguet has always been an exemplar of haute horology, favoured by aristocrats and the notable figures whom line the pages of history books. A reputation for innovation, Abraham-Louis Breguet conceived many inventions that have not been bettered over 200 years later. The centre zone is 18-carat gold coated in blackened rhodium, breathed upon by a gifted guillocher. The deft use of a rose engine and cutters has resulted in a wave pattern, exquisitely crafted by hand. Breguet has a long history of guilloché dating back to Abraham-Louis visiting London, discovering the technique and taking the decoration back to his native France. Surrounding the centre zone is a chapter, detailed with a satin brushed finish, and featuring applied golden Roman numerals. Facetted, open-tipped Breguet hands in 18-carat gold, coated with a luminous compound, convey the timezone on the centre zone. Overlapping the chapter are two subdials. At 2 o’clock a 24-hour dial resides. It features two different patterns to further exhibit the artisan’s craft. The contrasting lines, toy with light with pleasing outcomes. At 6 o’clock is the home time on the second subdial. Open-tipped Breguet hands feature once more, but this time in smaller form. 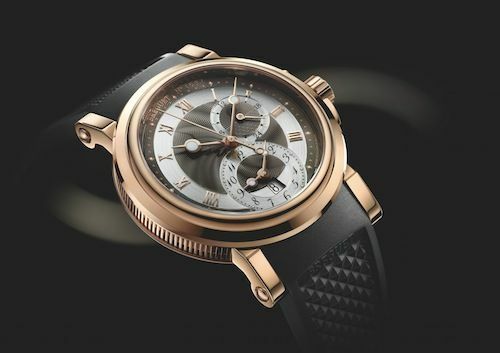 The hours chapter uses Arabic numerals or more precisely Breguet numerals in black. Within the home time the date indication is featured. Circumnavigating the extremities of the dial, the guilloché waves are repeated. The brand name features at noon with the unique production number positioned adjacent, faithful to the tradition of Breguet. Breguet had numerous talents but most of all he was an aesthete and the dial on this modern Breguet upholds that tradition perfectly. Caseband fluting features on the timepiece in keeping with the design language of Breguet watches of yore. A case diameter of 42 mm suits the character of the watch and appeals to modern tastes. I must confess some of the smaller models in Breguet’s history were sadly too small for my large physique. The dimensions of this model suit me perfectly. The lugs are welded, loyal to the design codes of classical Breguet models. However, the rubber strap is contemporary in character. But, when the lugs embrace the rubber strap, all aspects work in concert. The harmonious blend of traditional and neoteric is brave but perfectly judged. Breguet offer a steel variant, but the nobility of gold would always be my preferred choice when selecting a majestic timepiece of this quality. A sapphire crystal caseback affords a view of the magnificent movement residing within the case. The calibre 517F movement is self-winding and operates at a frequency of 28,800 vph (4 Hz). The watch has a power reserve of 72 hours. I would suspect this is partly due to the low friction proffered by the silicon in-line lever escapement. The use of silicon is an innovative approach by Breguet. The element is non-corrosive and non-ferrous, two key benefits in horology. Modernity has not led to the abandonment of finissage. On the contrary, Breguet will please purists with Côtes de Genvève on bridges and perlage on the plate. The hand engraved gold rotor features the brand’s nomenclature and is exquisitely executed. The Breguet Marine GMT 5857 harnesses all that is wonderful about Breguet’s classical timepieces. However, it offers great practicality making it ideal for daily wear. I often forget to remove a watch as I enter the shower, saturating my watch and the leather strap attached. The water resistance of 100 metres and the rubber strap would prove a perfect cure to my heedless moments. A key aspect of this watch’s appeal is its versatility. It can adorn the wrist whilst wearing jeans or attending a formal event attired in black dinner suit. This makes it ideal for the seasoned traveller who only wishes to take one watch with them. The added convenience of a GMT function is a further benefit when exploring distant lands. The refined appearance of this watch, distilled to perfection, is the primary lure which engenders my desiderate motives. It is gorgeous. Case: 18-carat rose gold; diameter 42.00 mm; Water resistant to 10 bar (100 m); sapphire crystal to front and solid case back. Functions: Zone time (Hours, minutes, seconds); Home time (Hours, minutes, date); 24-hour dial. Movement: Calibre 517F, self-winding; frequency 28,800 vph (4 Hz); 28 jewels; power reserve 72 hours.